Work to repair the shuttle Discovery's external tank is going well, but more time is needed to complete an engineering review and to develop the necessary flight rationale, the justification for launching with a repaired tank after unexpected damage. As a result, NASA announced Thursday, the flight will remain on hold until at least Dec. 3, four days after the opening of a short end-of-year launch window. If Discovery is eventually cleared for launch, countdown clocks would begin ticking around 1 a.m. on Nov. 30, setting up a launch attempt at 2:51:59 a.m. EST on Dec. 3. But officials cautioned that's a "no-earlier-than" launch target and if additional tests are needed, or if unexpected problems develop, the 133rd shuttle mission will remain on hold. The next shuttle launch window closes Dec. 6. If mission managers give up the possibility of an additional day in orbit, a launch on Dec. 7 would be possible. The next confirmed shuttle launch window opens at the end of February. But NASA managers are examining other possibilities in the mid-December timeframe, sources say, if Discovery misses the next window. Trying to get off on its 39th and final mission, Discovery was grounded Nov. 5 when sensors detected a major gaseous hydrogen leak near a 7-inch vent line quick-disconnect fitting on the side of the ship's external tank. After the countdown was called off, engineers discovered a large crack in the tank's foam insulation near the top of the ribbed intertank section that separates the hydrogen and oxygen tanks. At that time, launch was put on hold, delayed until at least Nov. 30, the opening of the next available launch window. When the damaged insulation was cut away, two 9-inch cracks were found in an underlying aluminum-lithium alloy stringer, or rib, making up the intertank section. After additional foam was removed, two more cracks were found on an adjacent stringer. Such cracks are not unusual, possibly the result of a switch to the lightweight, but more brittle, aluminum-lithium alloy used in the current generation of external tanks. But the cracks in Discovery's tank were the first to be seen at the launch pad, the apparent result of thermal stresses caused by exposure to supercold propellants. Engineers currently are splicing in replacement stringer sections and so-called "doublers" to add additional strength. When that work is finished, fresh foam will be sprayed on and sanded to blend in with surrounding insulation. In parallel, engineers are using high-tech scanners to assess the health of other foam-covered stringers on the side of the tank facing the shuttle to make sure there are no as-yet-unseen defects that could lead to structural problems or the release of foam debris during ascent. The team already has replaced the leaking hydrogen vent line quick-disconnect fitting with hardware that fits together with a better alignment. Leak tests using helium have been carried out and no problems were detected. With the resolution of the alignment problem in the original hardware, engineers are confident the ground umbilical carrier plate, or GUCP, quick-disconnect fitting will work normally whenever Discovery is refueled for another launch attempt. Another nagging problem also has been resolved. Before the hydrogen leak grounded Discovery Nov. 5, a subtle electrical glitch involving a main engine controller triggered an earlier delay. With the shuttle grounded by the hydrogen leak, a suspect circuit breaker panel in the ship's cockpit was replaced and investigators confirmed the electrical problem was due to contamination in a specific breaker. But the repair work is just one part of the equation. Engineers must develop a solid flight rationale showing the external tank crack problem is fully understood. A detailed structural analysis is underway to make sure the repaired tank can withstand the normal loads, or forces, experienced during fueling, launch and the climb to space. Another concern is the potential for foam insulation to break away from the repaired area of the cracks, or similar areas, that could hit the shuttle's heat shield during the early stages of ascent when impact damage can be most severe. Other issues include proving that any fresh cracks that might form when the tank is loaded with propellants are seen before launch and if they are not, that they will not grow or compromise the structural integrity of the tank during ascent. Finally, managers and engineers are discussing whether to carry out a fueling test to make sure Discovery's tank will not suffer additional damage when exposed to cryogenic conditions. If a fueling test is added, sources said, the countdown could still start as early as Nov. 30, but launch likely would slip to Dec. 5 to accommodate a 48-hour "scrub turnaround." 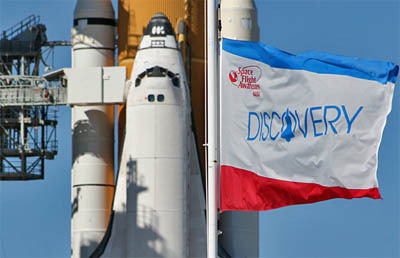 Bill Gersteinmaier, director of space operations at NASA headquarters, and John Shannon, shuttle program manager at the Johnson Space Center in Houston, had planned to brief reporters on the status of Discovery's launch processing Monday. But during a program requirements control board meeting Thursday, it because clear more time was needed to assess the crack repair work; to make sure no other cracks are present; and to develop the necessary flight rationale. The news briefing now is off until Nov. 29, when an official decision is expected to be announced. The primary goals of Discovery's mission are to deliver a storage module loaded with equipment and supplies to the International Space Station, along with a spare set of radiators for its external cooling system. Assuming an on-time launch Dec. 3, Discovery would dock with the space station around 11 p.m. on Dec. 4. The first of two spacewalks would begin around 8:45 p.m. on Dec. 6 with the second following around 8:15 p.m. on Dec. 8. Undocking would be targeted for just before 6 p.m. on Saturday, Dec. 11, setting up a landing back at the Kennedy Space Center around 9:55 p.m. on Monday, Dec. 13.